See Monday's post introducing the steps for your personal statement and resume for the law school application cycle of 2010-2011 before you continue with today's suggestions for law school letters of recommendations, LORs. As this is one of the few parts of your application timeline somewhat out of your control, be sure to start identifying and reaching out to your recommenders as soon as your personal statement and resume are finished. 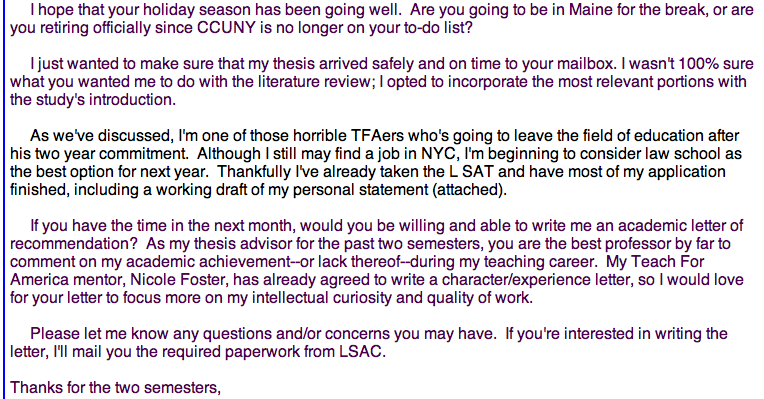 As a common courtesy--and to ensure a quality letter--give your recommenders at least one month and preferably two in order to finish the LOR. Remember that the goal is for each piece of your application to show a different part of yourself, emphasizing the breadth of your experiences by focusing on a few specific points with depth. Check your list of tiered law schools against LSAC's list of LOR recommendations. This will help you determine how many LORs are required, recommended, and accepted by the schools you're applying to. For example, Harvard will accept up to 4, but only requires 2 LORs. Many larger state schools recommend and only accept 3. Double check each school's specific suggestions or requirements for LORs. For example, Stanford "recommends" that you send in Stanford specific LORs along with a special supplemental Form C. When applying, there are few easier ways to say to the admissions committee, "I'm competent, take the time for due-diligence, and really want to attend your school" than to jump through their "suggested" hoops. Don't take anyone's advice on supplemental or special requirements unless it comes from the horse's mouth. In my experience, admissions officers at the law schools are excellent at answering legitimate questions about the process. Remind yourself of the qualities you need to emphasize in your application which only slightly overlap with the contents of your personal statement and resume. Since this is an academic reference, most law schools want at least one LOR from a professor, thesis advisor, TA, etc, even if you've been out of school for many years. Once you have cross referenced and prioritized the lists for the school's requirements/recommendations and your potential recommenders, start reaching out to the most promising ones. Hopefully you've been building a relationship with your professors and TAs your entire education--not only as potential recommenders, but because it definitely enriches the learning experience--but if not, don't let an e-mail or cold call for an LOR be the first one-on-one experience you've had with the person. Writing a meaningful and effective LOR is a difficult and lengthy process, and starting a relationship with, "I'm only interested in the letter, not in your academic/research/work/etc achievements," can sour even the best of your accomplishments. Because LORs are typically only a single page, much is conveyed through tone; do everything you can to ensure it is glowing rather than muted. 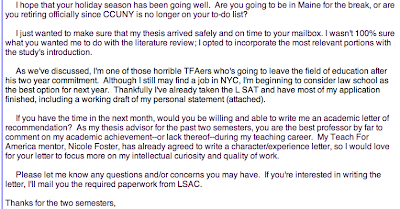 Here is an example e-mail I sent to one of my recommenders, my master's thesis adviser who I'd had many one-on-one consultations about education reform, New York City, and of course my thesis itself. He had a fascinating career in public education, starting in failing high needs schools and finishing at a competitive honors program. We disagreed about a great many things but consequently had intense discussions; since he was a career educator, some parts of Teach For America smacked of insincerity to him. Note that I had talked extensively with this professor for many hours over the course of a year; while I would normally have told him in person about my decision to attend law school and then ask for him to write an LOR, he was in another state at the time. He had also made it clear to email rather than call while he was looking over theses. A reader pointed out that generally the initial approach for an LOR should be in person, but in this particular case, it followed a clear precedent with the professor. Once I had received his blessing for being one of the "awful TFA corps members" who leave after the two year commitment, I included my personal statement and resume in a follow up email. I asked him to focus on my intellectual curiosity and strength as a researcher and writer since he was an excellent writer and had over a year's worth of my work to draw from. Providing him with a suggested topic not only ensured that aspect of my experience would be included in my application, it also helped him focus his letter on the aspects of me that he knew best. I tried to make the LOR process as painless as possible for my recommenders, including pre-stamped and -addressed envelops. These things are not only common courtesy, but also show that you truly care about your recommender's time. Next, I reached out to my Teach For America program director, my mentor throughout my two-year commitment. She and I were very close, and so I felt comfortable asking her about a reference in person. This was the follow up email including my personal statement and resume; during the initial conversation I asked her to cover my ability to overcome the difficulties of working in a high needs school, my commitment to ending education inequity, and my strength of character. By working with my recommenders so my LORs would cover these elements, I could focus on describing my growth process during Teach For America and how it had affected my desire to attend law school and focus on intellectual property. After my recommenders had turned in their LOR, I kept them updated on my application cycle and thanked them profusely every time something good happened. Once the cycle was over, I made sure to get them each a gift to show how much I appreciated their integral part of my chance to attend Harvard Law School. I found that if you approach the LOR process as a collaboration and with gratitude, it produces far better LORs and deepens relationships. The next process we'll cover in the law school application cycle is LSAC's website, including transcripts and those pesky school-specific PDF documents.